Demand for IT services will almost always exceed the resources available. It's not unusual for IT departments to work well over 40 hours per week just to keep up with operational demands. Amidst all this work, how do you know that you are addressing the needs of each of your customers? Although many organizations have a formal process in place for capturing departmental needs and transferring them to IT, it is rare that this data is kept in a central repository and tracked through delivery. Furthermore, many IT departments are forced into "decibel management" where the department with the most vocal leader, or the person with the highest title, can short circuit the IT prioritization process. The first step in maximizing the return on your IT investment portfolio is capturing IT demand. If you can create a central repository where business and technology needs are stored and measured objectively, you can make sound decisions about your IT investments. Most IT departments have many concurrent projects at any given time. As a result, it's difficult for a CIO to know which projects have a direct impact on the business. Often, CEOs and CFOs will ask for status on a project that the CIO delegated to an IT director or project manager. Without help, it is difficult to know which projects are important to your peers. In fact, in a May 2007 ComputerWorld survey, only 28% of IT executives report a high level of confidence in working with business counterparts on decision‐making criteria (Source: "The Current State of Supply and Demand Management in IT," ComputerWorld white paper, May 2007). Because each individual contributor will have a personal opinion about any given project, it is often difficult to ascertain which projects should be given priority. Most of the document‐centric processes used today to capture demand actually scatter information across several platforms. Business cases are created in Visio and PowerPoint, corporate governance and project requirements are distributed in Microsoft Word, and Excel spreadsheets are commonly used to track ROI and test cases. Tracking and updating this information in multiple formats complicates a CIO's ability to gauge demand for IT. Furthermore, it is difficult to track relevant information through multiple formats and keep documentation consistent when information changes. Identifying a way to minimize the demand entry points to IT allows for the creation of a consistent, repeatable process that will increase your chances of success. Many organizations struggle with the prioritization of projects and the allocation of IT resources. The difficulties actually begin when IT is forced to aggregate business and technology demands without the tools to do so. Most CIOs and IT directors have become fairly adept at compiling and storing demand information in a format that allows them to function. However, this type of system is usually limited to just the CIO and/or the IT department. Collection methods can be as simple as storing email in a specific Outlook folder, or as complicated as manually entering every customer request into a Help desk software package. When an IT department is managed in this fashion, it will be forced to be reactive. No matter how integrated a given system, it still relies on human intervention and manual workflow. As an example, I worked with a fairly large bank that used a simple spreadsheet to track and manage IT demand. Most significant technology requests were discussed at weekly meetings with branch managers, loan officers, and executives. One afternoon, I witnessed a discussion in the break room between the CIO and a top loan officer that ended with the CIO saying "I will get that put on the project list." We left the break room, and as he sat down in his office, the IT director walked in for our meeting. Unfortunately, because of an issue at an outlying branch, we now only had 15 minutes for our discussion instead of the 45 minutes we had originally scheduled. After our quick meeting, we shook hands and agreed to meet in 2 weeks with the engineering team to start planning a rollout. What do you think happened to the loan officer's request for IT services? Without a consistent, controlled entry point for IT demand, customer requests are frequently forgotten. Whether you are dealing with operational demands from line‐of‐business managers or corporate objectives handed down from the board of directors, it is imperative to capture demand from every aspect of the business. ITPM solutions use surveys, online forms, and integration with other software packages to aggregate data into a single demand management platform. With a few mouse clicks, business leaders and managers can create surveys and distribute online forms that gather employee feedback. If you have Help desk software with a case‐tracking system, it should have the ability to notice trends in the number and types of Help desk cases. ITPM systems capture this data in real time and immediately alert you when applications become troublesome and begin to reduce productivity. Even if you don't have a Help desk solution, ITPM has the ability to capture application trends, but a strong ITPM solution will integrate with your existing systems and protect your investments. By using these tools and controlling the demand entry points into your portfolio, you will have a much clearer picture of overall business health with more proactive management of your IT investment. For example, if the sales department is having an issue with laptop performance, an ITPM solution enables the VP of sales to enter a request to have the hardware replaced. Once IT sees the request, they can assign a dollar value to it and associate that request with a business goal. The project might tie into the corporate objective of increasing margins, increasing customer satisfaction, or even employee retention. With this information, you can examine the budgets available to meet the request and take the necessary steps. This streamlined process limits the amount of time needed to process the request, while increasing business agility. To demonstrate business agility, assume that while this laptop replacement was being considered, your department was finishing a pilot program for CRM software. That CRM system's purpose was to increase productivity by allowing the sales staff to quickly and easily access customer information. However, during the testing, the sales people consistently gave the application a low performance rating. Upon investigation, the CRM system's low rating was caused by a local agent running on each laptop. With this feedback, it becomes possible to immediately compare the costs and benefits of a new CRM package or new laptops for the sales staff. These types of scenarios occur on a daily basis in the world of the CIO. However, most of the time, organizations are forced to purchase new hardware after the CRM package has been implemented. An ITPM solution will provide your business with instant visibility into the use of your technology and allow you to make sound financial decisions. IT budgets have been slowly shrinking for years. With the recent downturn in the economy, this process has accelerated to the point where almost all IT departments spend up to 80% of their budgets on operational demand. CFOs and CEOs are forced to trim budgets from departments that don't directly impact the bottom line. As a CIO, it is imperative that you help the business grow and prosper by promoting IT as an investment. However, unless you know what resources this requires, it will be impossible to articulate this view to your peers. CIOs must have a clear understanding of IT supply and demand within their organizations if they want to succeed. 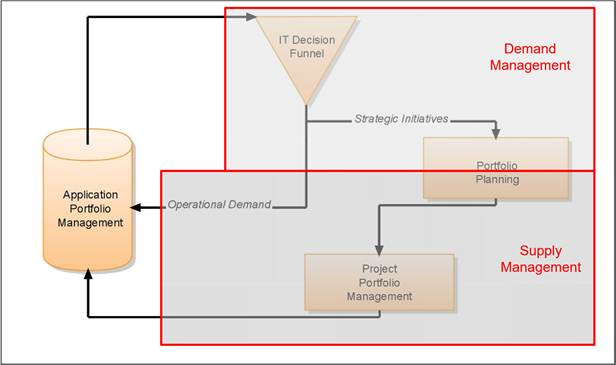 In the previous chapter, I used Figure 1.1 to present a model for viewing the ITPM business process. Figure 2.1 illustrates where supply and demand management fit into that model. Figure 2.1: Supply and demand management. Although most CIOs acknowledge that managing both supply and demand is a top priority, many are forced to focus on managing one or the other. There are many IT departments where bonus structures and recognition are based on customer service ratings or meeting project deadlines. This concept insures a high level of service delivery, but it only addresses the supply side of the equation. At the other extreme, IT departments that are focused on delivering applications and services only to the most profitable departments find themselves managing exclusively to business demand. In this alternate scenario, IT supply becomes overloaded—creating conflict within the organization. In order to manage IT as a business investment, IT supply and business demand must be accurately measured and balanced against each other. How do you explain to business leaders that they need more than IT can reasonably provide without being perceived as negative? I have been in numerous meetings where CEOs roll their eyes as the CIO explains his goals can't be met without more money or people. When asked why that is the case, most CIOs will list the projects, deadlines, and personnel that are assigned to complete the work. This discussion frequently spirals downward into comments and observations on the particular skills of the IT staff. The only way to avoid these discussions is to focus on objective metrics. With an ITPM solution, you can manage both supply and demand effectively. ITPM provides the CIO with an objective view of the situation, avoiding subjective resource discussions. A central repository for supply and demand data allows you to quickly illustrate what IT can reasonably provide in a format of the viewer's choosing. Previously, I wrote about innovation capacity, which is the comparison between the amount of resources working on operational demand versus the amount of resources working on strategic initiatives. Although this metric may have some value to a project manager, it will be much more important to an executive who is concerned with remaining competitive or even dominant in the market. If you can clearly see both operational demand and strategic initiatives, and allocate the right resources to the right strategic initiatives, you have a much better chance of dominating your industry. The demand for IT services can originate from many sources. Imagine that you are the CIO of a major retail chain that sells blended coffee beverages. Last month, you were told by the legal department to comply with new PCI security regulations. Business objectives such as increasing margins and customer satisfaction are executive priorities. Data connectivity to each location is being examined, and the corporate training division has been asked to cut travel costs. In order to figure out which projects have priority, you will need to gather hard data for each demand into a single view, and weigh the costs and consequences. Many CIOs are capable of managing a scenario like this with standard front‐office applications such as the Microsoft Office suite. The personnel hours involved in gathering requirements, setting metrics, and providing data to your peers for this many projects would normally require a large team. However, much of this process can be automated with an ITPM solution. Figure 2.2 offers a diagram that illustrates how this situation might look. Figure 2.2: Automated workflow diagram. A comprehensive method for evaluating demand is to implement an automated workflow. Once a request for services has been submitted, an automated system can apply certain business rules that move the request through the appropriate people in an organization. An effective ITPM solution will allow you to create workflow rules and apply them to any business element. The example tracks a basic request for services through the corporate process. Remember that automated workflow can be customized to fit the business processes of any organization. Figure 2.2 shows a user request being routed through the system. Based on workflow rules, the request is checked against an internal template to make sure all the required data has been entered. Then the request moves on to a decision maker who can determine whether the request is relevant to the business and promote the request into a candidate project. If a request looks like a viable candidate, the system will forward the request to the appropriate departments to collect data. As a part of the approval process, automated tasks such as risk assessment surveys can be collected from the parts of the business that will be impacted by the project. The main focus of automated workflow is to accurately gather and store relevant data for the business leaders with minimal human intervention. After all the data has been collected, an ITPM solution will allow executives to quickly determine whether the candidate project is relevant to the business and should be pursued. Once you have data in a centralized system, how will you view it? The exact same data sets will convey different information to different roles. What if you could track business and technology objectives in an ITPM system and map them to each other? A mid‐level manager may not be interested in which of his or her projects are tied to specific objectives but the executives will be. Every organization has different processes for approving purchases and managing resources. If an ITPM solution is going to fit your organization, it has to be flexible enough to incorporate processes that already exist. You should be able to enter information about your business processes and use ITPM to create and illustrate automated workflow. Once IT has this system in place, you can customize the views into your IT investments. Custom views not only provide the relevant investment data but also actually illustrate IT's business processes to other departments. As a result, anyone who needs to know the status of a particular request can click on a few links to access the information they need. Corporate executives are always faced with time limitations. There is rarely enough time to collect all the relevant data for any specific project and determine whether it aligns with the corporate vision. As a result, most department heads are constantly scrambling to gather disparate information and reformat the data into something a CIO can quickly interpret. Utilizing an ITPM solution allows you to input your corporate objectives and use them as a sorting mechanism. For example, suppose you have been told to implement a new logging application that tracks which users accessed which applications. A project such as this would usually be associated with Sarbanes‐Oxley (SOX) compliance. With an ITPM solution, your CIO can open a simple browser listing the corporate objectives. By expanding the list under "SOX," he can see the allocated budget, the amount spent so far, and whether the project is on time. This information is usually coded with a red/yellow/green indicator, giving the CIO the needed data at a glance. Table 2.1 is a basic table that is similar to an executive‐level view from an ITPM solution. Keep in mind that by its nature, ITPM allows for complete customization to fit your business. Any view can be created for any role within the company. So, while you examine this chart, think about what data might be useful to the executives in your organization. Chances are, no matter what information you come up with, it can be delivered through an integrated ITPM solution. Although this table may look like a standard spreadsheet, its data has been collected electronically from various users and departments throughout the organization. The automated workflow process has taken the data and built a table that is relevant to the role of the CIO. As you can see, it contains financial return data as well as business objectives and recommendations from other executives. Furthermore, all these fields are active data, enabling the viewer to "drill down" to see additional details if needed. CEOs are usually concerned with how technology projects are tied to reaching corporate goals and how close those projects are to completion. They use this information to maneuver the company to a specific position in the market and provide stakeholders with the data they need. But a solution that served only the executives would not be nearly as valuable as one that could assist the entire organization. For an ITPM solution to provide value throughout the business, it must be useful to people who fill many different roles. It makes little sense to offer the business leaders a tool to enhance productivity that requires a separate system to track and manage projects. By integrating these functions into a single package, everyone in the business has instant visibility into the projects that are relevant to their own success. Project managers are task oriented and interested in tracking and assigning corporate resources. Gantt charts, timelines, and requirements documents are the tools these managers use to do their jobs. Traditionally, charts and timelines are created with Microsoft Project or Visio. Requirements documents are often stored in separate Word documents or Excel spreadsheets. Project managers would be much more productive if they had a central "window" into these different tools that would allow them to view and alter them without opening multiple applications. Storing documents in multiple applications inevitably leads to version‐control issues. It is difficult to remember if new project data has been entered into every relevant document. For example, a lead implementer suddenly needs a few days off. The project manager can update the project timeline and task orders, but what if the objectives in the next project scope include a deadline that is now unattainable? This problem might be solved by implementing a document management system with version control and tracking. More efficient is a single management solution that includes internal version‐control capabilities. This functionality allows staffing adjustments to be viewed in real time and their impacts reflected across the entire organization. Centralized data collection and analysis also allows for the creation of simple but very powerful visual aids. Earlier, I mentioned the executive meeting where the CIO and CEO are at odds because the demand for new projects is constantly exceeding IT's ability to supply resources. If all your supply and demand data are in an ITPM solution, you can create a simple graph to clearly illustrate the situation with just a few mouse clicks. 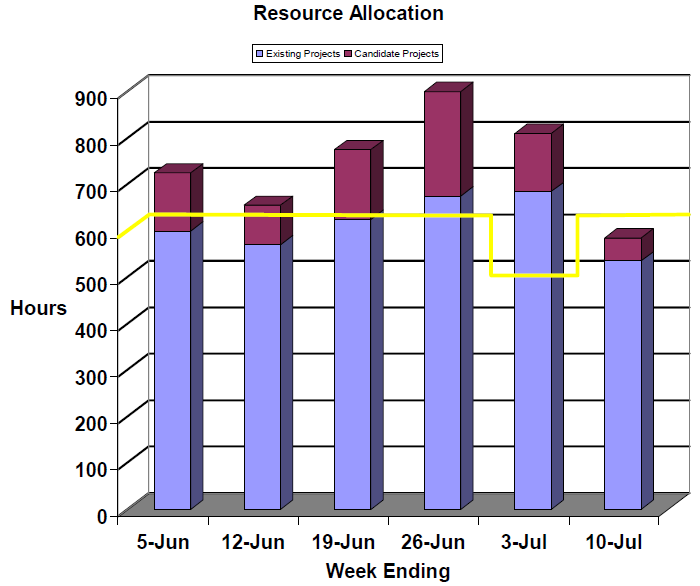 Figure 2.3: Resource allocation graph. This graph is a simplified version of what an effective ITPM solution can offer. If you are employing 15 implementers, you will incur 100% utilization at 600 personnel hours per week. This is represented by the solid yellow line, which even illustrates the hours lost during the 4th of July holiday. This basic data provides your peers with an overall view into the balance of supply and demand in your organization. Most solutions will also offer a Gantt chart that is tied directly to the graph. With this functionality, you can examine "what if" scenarios, showing other departments the current utilization of your resources. ITPM software will also let you drill‐down to the data behind the graph so that you can examine which specific projects are taking the most time, and determine whether their business goals are in‐line with the resources they are consuming. Like everything else in a business, one of the main reasons to implement ITPM is the financial benefit of working on the investment that offers the greatest return. You can reduce the number of applications you are currently using and phase out poor performers that cost your organization more money than they generate. A view into the financial health and viability of projects and applications is a compelling reason to implement ITPM. The role of the CFO is to track corporate capital through an organization and maximize the financial return. Unfortunately, IT is frequently considered a cost center to the finance department because technology ROI and TCO are difficult to calculate. Further complicating the CFO's job is the fact that software applications rarely function as advertised, making it is difficult to determine the financial benefits they provide. Linking applications and projects directly to corporate goals and providing a simple assessment is easy with ITPM. If you were able to gather and track IT demands from every aspect of the organization, and centrally mange that data, it would be a simple matter to provide a customized "window" into the financial portion of IT demand data. Most ITPM solutions will offer many more predefined fields that can be used as part of the tracking systems. Advanced solutions will also give you the ability to add custom fields and assign them to any element within the system. Table 2.2 provides a basic example of IT data that could be valuable to a CFO. For both CFOs and CIOs, ITPM's ability to align the demand for IT with the appropriate funds is an important feature. Table 2.2 illustrates both corporate objectives and funding sources. Additional columns that might be useful to a CFO include budget totals, budget spent, and cost of capital. All this data can be used to clearly map demand for IT to the appropriate funds, and change those funding sources as needed. We Have the Data, Now What? Chapter 2 illustrates the shortcomings of current demand collection and management of IT. By limiting the number of data entry points, collecting relevant data, and supplying rolebased views into the IT organization, an ITPM solution can enable the CIO to move from reactive to proactive management. Furthermore, once the demand for IT resources is balanced with IT supply, an accurate measure can be taken of your innovation capacity, and you can move IT away from being a cost center. In Chapter 3, we will further explore the balance between resource supply and business demand as well as how to prioritize IT investments. Eliminating decision‐making silos, incorporating data from previously untapped departments, and maintaining consistency and transparency will be a primary focus. Chapter 3 will also illustrate how to increase the value of IT by becoming a business collaboration department as opposed to a technology delivery service.